A couple of weeks ago, I reviewed the minimalist designer watch ZIIIRO Celeste ZIIIRO Celeste Watch Review and Giveaway ZIIIRO Celeste Watch Review and Giveaway I'm not much of a watch person. Between 1995 and 2012, I've only owned two watches, and both of them were relatively nondescript, plain and unattractive. Read More and I absolutely fell in love with its geeky, quirky take on time. Today, I’ll be looking at something similar from the renowned geeky watchmaker, Toykoflash — the Kisai Online LCD watch, a $169 watch with an emphasis on design. Does this futuristic watch deserve a spot in your watch box? Does it look as good in person as it does online? Is the design practical and suitable for everyday use? If you’re aching to find out if you should spend $169 on this watch, find out in the details in my review. Plus, we’re also giving this Tokyoflash Kisai Online LCD watch away! While the ZIIIRO Celeste ZIIIRO Celeste Watch Review and Giveaway ZIIIRO Celeste Watch Review and Giveaway I'm not much of a watch person. Between 1995 and 2012, I've only owned two watches, and both of them were relatively nondescript, plain and unattractive. Read More came packaged in a stylish circular box, this Tokyoflash Kisai Online LCD watch was shipped in a plain carton box. So, in terms of packaging, it was a total let down, hence the lack of unboxing photos here. No matter, since all we’re interested in is what the box contains so I’ll look past the unattractive packaging and go straight to the watch. If you’re a seasoned online shopper, the fact that some products are made to look better online and in photos, from capturing them at the right angles and image editing, probably isn’t much of a surprise to you. Unfortunately, the Tokyoflash Kisai Online LCD watch was poorly (falsely?) represented online. In person, it was pretty much a disappointment. What you can’t see from the product images on Toykoflash’s website is that the watch is really quite thick. And it wasn’t until I put it on that I realised just how heavy the 160g watch is. In my mind, I was expecting a watch with finesse and a futuristic, elegant design. Instead, in all honesty, I received a product which pretty much looks like a counterfeit watch you might find in an Asian night market. This Toykoflash Kisai Online LCD watch features a black or silver stainless steel case with an adjustable bracelet strap. Each design is sold in one of 3 LCD colour options: natural, blue and red. The case is also made of stainless steel, with what I’m assuming is a plastic face cover, and measures 33mm x 51mm x 14.4mm — that’s right folks, the watch is over 1cm thick. The steel used to construct the watch doesn’t exude a quality finish either. In fact, I’m sad to say that it sounds and feels rather plasticky, hollow and cheap. Due to the largeness of the case and the relative skinniness of its strap, I found the watch to be quite top-heavy and not at all comfortable to wear. What initially attracted me to this watch was the LCD display and its vertical line design. On paper, the cool cryptic pattern has the potential to turn something as boring as telling time, into an interesting, head-turning event that people will enjoy talking about. In reality, I’m afraid that it doesn’t even come close. The red on black colour scheme not only makes the lines and “digits” difficult to discern, it can sometimes be impossible to read in certain conditions. Even though the LCD is constantly on, there isn’t enough contrast between the lines and the background, so they blend into each other — another aspect of the watch which was falsely represented by their manipulated product images. In low-light conditions, this turns into a nightmare. The fitted electroluminescent light source isn’t even close to bright enough. So don’t bother looking at this watch if you expect to read the time at night. One of the main selling points of this watch is a cryptic mode, which adds even more lines to its already complicated design. This is achieved using an accelerometer — swing the watch towards you to reveal the time, swing it away from you to enable the cryptic mode. In the image below, I have the watch upside-down and as you can see, when the watch is in cryptic mode, it’s impossible to tell the time. Fantastic. Along with the current time, the Tokyoflash Kisai Online LCD watch also has a date indicator and an alarm, which beeps like a cheap watch and is dreadfully impossible to set. So my advice to you is: never use it. Should you buy the Tokyoflash Kisai Online LCD watch? As I mentioned in the beginning of this review, Tokyoflash is a respected geeky watch maker. Several of their designs have made it to well-respected designer blogs. So, as a consumer who paid $169 for the Kisai Online LCD watch, I expected more. I would have preferred the LCD to be easier to read. The case could have been slimmer. The stainless steel finish could have been better. The EL light could have been brighter. The entire watch could have been lighter. Overall, its shortcomings prevented me from utilising the watch to its fullest potential. Gizmos and gadgets always get my attention. who wins this funky geeky watchie? Excellent review and thank you for the giveaway. Good luck to everyone! Cool watch. After I got my smart phone I never needed one anymore but that thing looks pretty slick. ill have this one Mr Chung! looks pretty awesome....i want this. Actually it's not. Just open our Google+ page [no longer available], scroll down to load a sufficient number of posts, then search for the keyword 'Giveaway' and find the code and link to the Giveaway you would like to participate in. This Giveaway was announced twice on Google+, but only the first announcement contained the code. Apologies for that! this watch seems to be very amazing and geeky!! Thanks for the review. I am always looking at great geeky stuff, but I don't want CRAP. Hopefully Kisai Online will read what everyone has posted and improve the watch. Looks like a throwback to the early LED watches, but I bet it would be fun messing about with it. Watch looks like cool piece of jewelry. Don't know how you tell time with it. can't seem to be able to enter the KISAI giveaway..what's up with that? Looks like a cool watch. Good luck everyone!! Very cool just what I needed!!! Nice Giveaway!! No one else will be able to read your watch so once you master it that'll be cool. The reviewer doesn't seem impressed! Sounds like the winner (?) will at least be the only guy in town with one of these! Looks so cool! My husband would be wild about this! Geez, you bash the watch design, recommend not to buy it and THEN you want to give it away? No thanks. Heck, why don't you just throw it away? It would probably end up in the trash of the winner anyway. It's really bad to know that your are not offering giveaways to Pakistani internet users. Really bad. Love the watch!!! Love make use of as well!! warch is not geeky but something is better than nothing :) participated. hmmm i like the design of this watch.. Interesting, love a new toy. You are right....If you can read a watch, then its pretty much useless. Disappointing considering Tokyoflash's street cred...it looks more like a street buy. I don't really like watches but his one it's kinda interesting. You know, I honestly haven't worn a watch in 15+ years now. Every other device in the world tells the time - TV, phone, energy monitor, even my cooker - I can't help thinking having a device that ONLY tells the time is just so pointless. Exactly. And if i was going to wear a watch, it'd be a retro steampunk-y thing. Embrace the anachronism! Have you looked into the Omega Speedmaster? Its probably the only watch you'll find that is really accurate, multi-atmosphere, and multi-function (Tachymetere, stopwatch, AND DATE!) all starting at $3K. But you can get one that's all mechanical and self winding - for like $1500 more. More like a girlish watch. By checking images I've found that its displaying everything in format of lines ! Looks good, would like to try it. I don't wear watches but making an exception if i win this. I would love to win this very nice geeky watch! Thanks make use of and Sir Jackson! I would love to have this. Explaining its design would be worth it! 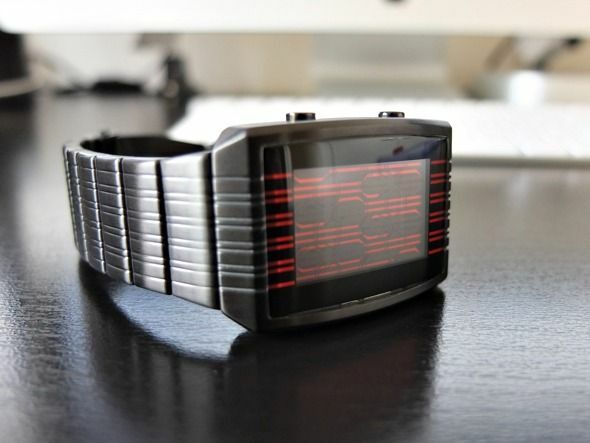 this watch seems to be very amazing and geeky ! !